A couple of posts ago, we highlighted the apparent success of our education system, despite conventional wis-dumb that says that we’re failing to create enough scientists and engineers. The column in Business Week showed that, far from an inadequate supply of engineers, for example, rather there is an inadequate supply of U.S. jobs for all of the engineers we’re creating. Further, the reported astoundingly large numbers of engineers and scientists supposedly coming out of India and China may be a distorted and inflated number; the two countries are producing quantities of degrees, many of which are far less than minimum world-class. So, MUDGE had a couple of days to feel relief, his faith somewhat restored in our often-maligned U.S. education system. Another precinct has been heard from, bird-dogged, I’m remembering, by Digg actually, and this news, from the education trenches, is not good. Mark Morford, a San Francisco columnist has the following dire report. I have this ongoing discussion with a longtime reader who also just so happens to be a longtime Oakland high school teacher, a wonderful guy who’s seen generations of teens come and generations go and who has a delightful poetic sensibility and quirky outlook on his life and his family and his beloved teaching career. And he often writes to me in response to something I might’ve written about the youth of today, anything where I comment on the various nefarious factors shaping their minds and their perspectives and whether or not, say, EMFs and junk food and cell phones are melting their brains and what can be done and just how bad it might all be. His response: It is not bad at all. It’s absolutely horrifying. Morford’s correspondent, and his opinion seems to be ratified by many of the over 500 comments appended to the story, is quite pessimistic about the next generation. The next graf contains a pithy and disturbing simile, discussing the magnitude of mandated testing taking place in schools. Ouch. No calf left behind? I have trouble reconciling the upbeat tone of the higher education story from Business Week the other day to this appalling one. Both are true, I am forced to suppose. Our successful college students seem to be so despite the public education they receive to supposedly prepare them for that success. We do this every so often here at L-HC, when the press of that darned pesky real life intrudes on quality blogging time. Here are three recent stories that grabbed MUDGE‘s interest, and we hope it will pique yours. 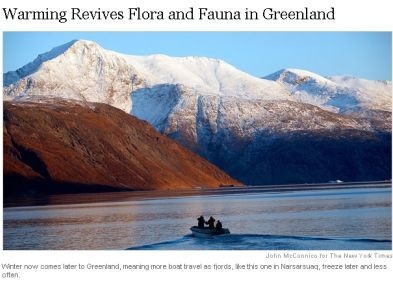 When using the words “growing” in connection with Greenland in the same sentence, it is important to remember that although Greenland is the size of Europe, it has only nine conifer forests like Mr. Bjerge’s, all of them cultivated. It has only 51 farms. (They are all sheep farms, although one man is trying to raise cattle. He has 22 cows.) Except for potatoes, the only vegetables most Greenlanders ever eat — to the extent that they eat vegetables at all — are imported, mostly from Denmark. Everybody knows that global warming is a nefarious invention of Al Gore and every other lefty in the world. I’m sure that this story is totally fabricated. Everybody knows Iceland is green, and Greenland is icy. Next: To the moon, China! BEIJING, Oct. 24 — With a regional space race heating up in Asia, China launched its first lunar probe on Wednesday as the Communist Party moved a step closer to fulfilling its ambitions of one day reaching the moon. 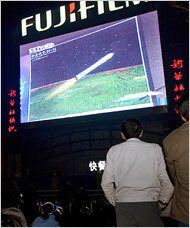 An animated image of the launch of China’s lunar orbiter broadcast on a large screen today in Beijing. The Chang’e-1 satellite, named after a Chinese goddess who flew to the moon, lifted off at 6:05 p.m. Officials and tourists watched the launching at a site in Sichuan Province, while state television provided coverage to the rest of the nation. It may not be a lifeline, but at least it’s a vote of confidence. On Oct. 23, state-owned Chinese brokerage Citic Securities agreed to invest $1 billion in beleaguered investment bank Bear Stearns (BSC ). Citic will buy 40-year convertible trust preferred securities equal to 6% of Bear’s shares, with the option to boost the stake to 9.9%. In return, Bear will pay $1 billion for six-year convertible debt representing a 2% stake in Citic, with an option to go to 5%. Citic isn’t the only cash-flush foreign institution taking advantage of U.S. bank stocks that have been whacked by the subprime crisis and stagnant earnings. Expect more deals in the months ahead. Finally: One Laptop Per Child for India after all? As noted before, an entire brochure could be developed around our posts on the One Laptop Per Child initiative. Here’s the latest wrinkle. India, who originally dissed OLPC (intending, apparently, to adopt a home grown product), has taken a new look, now that OLPC is no longer vaporware. 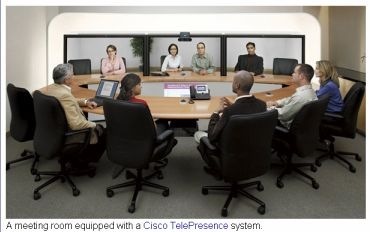 CAMBRIDGE, Massachusetts (AP) — The so-called $100 laptops for children may make it to India after all. Children in a rural, one-room school in the Indian state of Maharashtra are using the computers. Last year,India rebuffed One Laptop Per Child, the Massachusetts Institute of Technology spinoff that created rugged little computers for kids in the developing world. …. a pilot test began recently in which 22 children in first through fourth grades in a rural, one-room school in the Indian state of Maharashtra are using the computers. We believe, because we’ve been hearing it for years, nay decades, that test scores are declining, and literacy and especially numeracy and interest in science is declining. Salzman and Lowell found the reverse was true. Their report shows U.S. student performance has steadily improved over time in math, science, and reading. It also found enrollment in math and science courses is actually up. And we keep hearing that comparisons of our children’s performance versus those of many other countries are dire. So now comes the rub. We’ve been too successful in our aim to direct our students into technical degree programs. As far as our workforce is concerned, the new report showed that from 1985 to 2000 about 435,000 U.S. citizens and permanent residents a year graduated with bachelor’s, master’s, and doctoral degrees in science and engineering. Over the same period, there were about 150,000 jobs added annually to the science and engineering workforce. Where have we gone right? And, about the shortfall we have been hearing about forever, you know, the one about China and India graduating so many more engineers and scientists than the U.S.? How can we not fall behind? In previous columns, I have written about research my team at Duke University completed that shattered common myths (BusinessWeek.com, 7/10/06) about India and China graduating 12 times as many engineers as the U.S. We found that the U.S. graduated comparable numbers and was far ahead in quality. Our research also showed there were no engineer shortages (BusinessWeek.com, 11/7/06) in the U.S., and companies weren’t going offshore because of any deficiencies in U.S. workers. So, there isn’t a lack of interest in science and engineering in the U.S., or a deficiency in the supply of engineers. But there is a deficiency in jobs for all of these engineering graduates! And, if you follow the links to earlier Wadhwa columns, you’ll find that there is a great deal of confusion about what exactly is an engineering curriculum in China, and a shortage of jobs there also. MUDGE has been a part of the blogging community (and a ruefully mostly derivative member at that) for a short time, and I’ve taken with a grain of salt the disparagement of what many in the blogosphere call MSM, an acronym for mainstream media. But, so many of my own rock solid assumptions have been skewered in this month of October, 2007 alone, (for example, here and here) that I have to step back and reconsider. Our White House fed assumption regarding Saddam Hussein’s purported weapons of mass destruction is an example of a big lie from our immediate past. On a lesser scale of import than our horribly pointless Iraq misadventure, there are our assumptions about diet and health. Our assumptions regarding the sad state of our education system compared to the rest of the developed world. Our assumptions about how many more engineers China and India are graduating every year compared to the U.S.
Let’s assume carefully out there! You are currently browsing the Left-handed Complement blog archives for October, 2007.